Photo Credit: CNS/Yoichi Okamoto, courtesy LBJ Library - Civil rights leader the Rev. 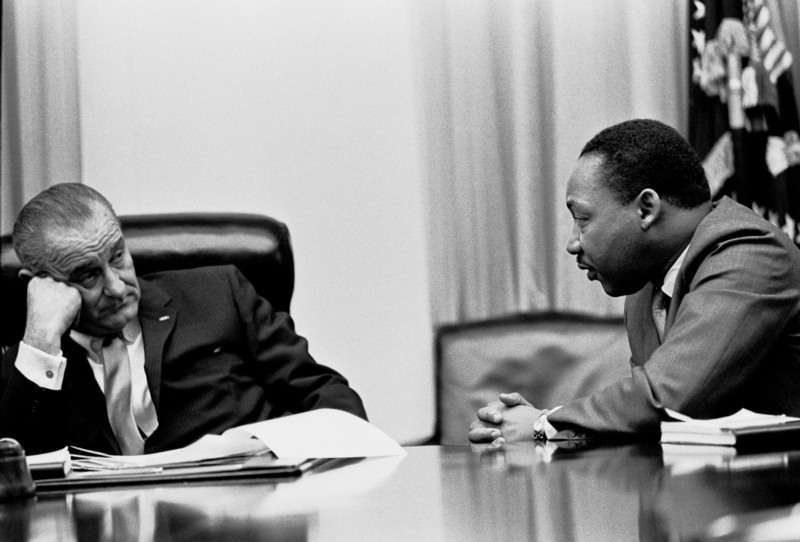 Martin Luther King Jr. talks with U.S. President Lyndon B. Johnson in this undated photo. Johnson signed the Civil Rights Act into law July 2, 1964. Martin Luther King Jr. Day is celebrated Jan. 21 this year. Societies today need “artisans of peace,” like the Rev. Martin Luther King Jr., “who can be messengers and authentic witnesses of God the Father, who wills the good and the happiness of the human family,” said the president of the U.S. Conference of Catholic Bishops. King “was a messenger and true witness to the power of the Gospel lived in action through public life,” said Cardinal Daniel N. DiNardo of Galveston-Houston in a statement issued for the observance of Martin Luther King Jr. Day Jan. 21, the federal holiday marking his birthday. “This year, as we again mark the anniversary of his life, and reflect upon the 51st anniversary of his death, we are thankful for the path forged by King and the countless others who worked tirelessly and suffered greatly in the fight for racial equality and justice,” the cardinal said. In recalling how King “contended with policies and institutional barriers of his time, many which persist today,” Cardinal DiNardo said, “we renew our pledge to fight for the end of racism in the church and in the United States. Catholic Schools, social justice, racial justice, Vermont Catholic Charities, Vermont Catholic Professionals, Martin Luther King Jr.